Q. Program to insert a new node at the beginning of the circular linked list. In this program, we will create a circular linked list and insert every new node at the beginning of the list. If the list is empty, then head and tail will point to the newly added node. If the list is not empty, then we will store the data of the head into a temporary node temp and make new node as the head. This new head will point to the temporary node. In simple words, the newly added node will be the first node(head) and previous head(temp) will become the second node of the list. New represents the newly added node. Earlier A was the head of the list. When new is added to the beginning of the list, new will become the new head, and it will point to the previous head, i.e., A. 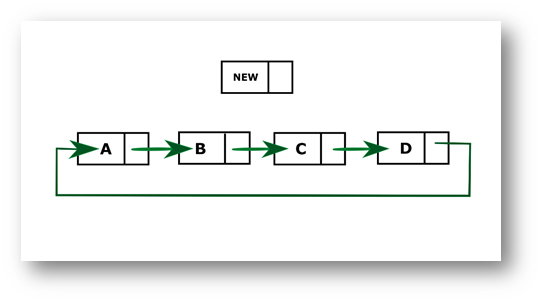 Define another class for creating the circular linked list and it has two nodes: head and tail. It has two methods: addAtStart() and display() . Both head and tail will point to newly added node. If the list is not empty, then the newly added node will become the new head, and it will point to previous head.